Kasumi Ishikawa won't appear in the Women's Singles for the second consecutive year in Germany after the Japanese star exited the Seamaster 2017 ITTF World Tour Platinum German Open, being held in Madeburg, at the semi-finals stage of the competition on Sunday 12th November. The third seed met the no.1 seed Zhu Yuling in an exciting last four encounter and despite positive outings in games two and three for Kasumi Ishikawa it her Chinese opponent who ultimately came away with the win (11-4, 12-10, 12-14, 11-5, 11-8). 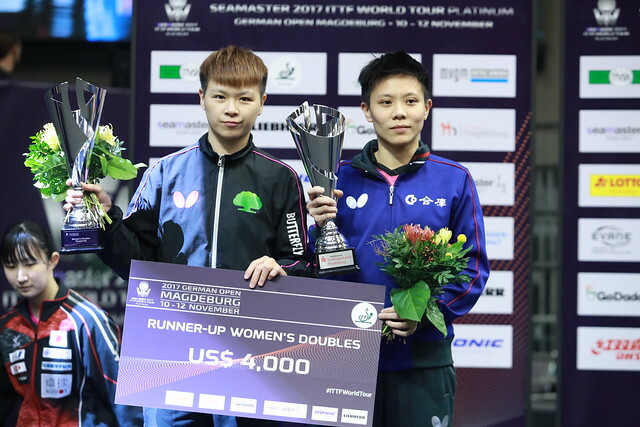 Success in the penultimate round means that Zhu Yuling will appear in her first Women’s Singles final of this year’s ITTF World Tour and the world no.1 is keen to leave Magdeburg with silverware to her name. “She’s been in good momentum lately and when I was leading 5-2 in the third game, she didn’t give up and challenged me for every point in the match. I feel I gave her too much room in that third game, that’s something I have to review now after the match. I have not made the final of any World Tour event this year, so I’ll hope to put up a good performance later to aim for the title”, Zhu Yuling. Awaiting Zhu Yuling in the final is rival Chen Meng, who came through her semi-finals match against fellow compatriot Feng Yalan in the lower half of the draw. Feng Yalan, who entered the match unseeded, actually made the slightly stronger start to the match, claiming the opening game in deuce but second seed Chen Meng responded well and eventually progressed from the round with a six games victory (10-12, 11-6, 11-4, 6-11, 15-13, 11-5). “That was another tough match. In the 5th game I had to recover from 6-10 to win the game. These last two days I have gotten use to having to comeback from behind to turn the tides in my favour. Next in the final, I hope to keep up this momentum and the fighting spirit from when I was trailing behind”, Chen Meng. The Women’s Singles gold medal match will follow the conclusion of the Men’s Doubles final in the afternoon session of play.